The Papua New Guinea government recently signed a liquefied natural gas deal worth about $US10 billion with an American-Australian consortium led by ExxonMobil, the world’s largest publicly traded oil company. The massive project, which could double PNG’s gross domestic product, highlights the vital economic interests driving the Australian government’s operations in the South Pacific. Once operational, the venture will extract gas from six fields in the Highlands, a remote and undeveloped area. After treatment at a plant in the Southern Highlands, the gas will be piped 265 kilometres to a liquefaction and storage facility near the capital, Port Moresby, before being exported to Asian markets. More than 6 million tonnes of liquefied natural gas (LNG) will be exported annually. ExxonMobil holds a 41.6 percent share in the venture. A number of Australian companies are minor partners, including Oil Search (34.1 percent), Santos (17.7 percent) and AGL Energy (3.6 percent). The companies signed a joint operating agreement, which covers the commercial aspects of the project, laying the basis for the deal to proceed to the engineering and design phase. PNG Deputy Prime Minister Puka Temu said all the financial terms were almost completed. According to Temu, the project would begin production in 2014 and quadruple PNG’s GDP. It is not clear how the deputy PM arrived at this forecast. An impact study commissioned by ExxonMobil and issued by economic consultants ACIL Tasman estimated that the gas deal would increase the country’s GDP to $US5.1 billion, compared to $2.4 billion in 2006. The PNG government is predicted to obtain a net cash flow of $31.7 billion over 30 years. The participating US and Australian mining companies expect to reap larger sums, with accrued gas revenues over the life of the project estimated at $95 billion. This figure, however, could be as high as $123 billion if oil and gas prices remain high. Total costs, including capital investment and recurrent expenditure, amount to $14.9 billion. The gas deal is one of a number of new projects launched in PNG. The Pacific country has become an increasingly attractive site for transnational mining and petroleum companies looking to exploit its reserves of gold, copper, oil, natural gas and other resources. Escalating minerals and commodities prices, driven in part by China’s strong economic growth, have produced new investment in projects once regarded as unprofitable. PNG’s mineral revenues increased five-fold between 2002 and 2007 due to higher world prices, particularly for gold and copper. According to the World Bank, the past five years have seen the longest period of uninterrupted economic growth in PNG since the country received formal independence from Australia in 1975. Fitch Ratings recently raised PNG’s long-term foreign currency rating from B to B+ as a result of increased investment and a “relatively stable political environment”. Moody’s Investors Service recently added that PNG’s B1 government bond rating would likely be significantly upgraded once the gas project commences. China’s economic boom has benefitted a narrow PNG ruling elite both indirectly, through rising mineral prices, and directly, through Chinese investment in the country. Beijing’s international search for the raw materials to sustain its rapid industrialisation drive has led it to cultivate relations with PNG and other South Pacific states. In 2006, the PNG government signed a $1 billion financing agreement with China’s state-owned Metallurgical Construction Corp to open the Ramu nickel mine. The mine is among the largest of Beijing’s overseas direct investments and was driven by a shortage of raw materials for China’s stainless steel industry. The Chinese government has stepped up its diplomatic activity in the region and provided relatively large sums of aid money for high-profile infrastructure and investment projects. In PNG, Chinese aid money funded the construction of the foreign ministry building and renovations to the national parliament. Beijing has also promoted ties between the Chinese and PNG military. Unlike Australian aid, Chinese money does not come attached with so-called “good governance” conditions, and has provided the PNG elite with a significant counterweight to Canberra’s dominance. Australian ruling circles are increasingly concerned about their declining hegemony in a region long regarded by Canberra as its exclusive sphere of influence. PNG is the most strategically important country in the South Pacific, lying only 160 kilometres from the northern-most tip of Australia and bordering key naval routes. It also has the largest economy of any of the small Pacific island states. PNG is regarded as the cornerstone of Canberra’s broader dominance in the South Pacific. The Exxon-led project underscores the financial interests bound up with the Australian government’s relations with PNG. Australian corporations have more than $US4 billion invested in the country, including major companies such as Rio Tinto, BHP and Oil Search, which have siphoned large profits out of the country. Concern for Australia’s interests in the region played no small role in driving the former Howard government’s military-police interventions. Following Canberra’s takeover of key posts in Solomon Islands in 2003, PNG was targeted for similar treatment. More than 100 Australian Federal Police (AFP) were dispatched, along with a number of officials and “advisors” who were inserted into the PNG state apparatus under the Enhanced Cooperation Program. These police, however, were withdrawn in 2005 following a court ruling that stripped them of immunity from PNG law. Highlighting its commitment to Australian imperialist interests in the Pacific, the Rudd Labor government is discussing whether to send the AFP back into PNG. While the new $10 billion gas project is being welcomed in Port Moresby and Canberra, it will bring no benefit to the vast majority of the population. Despite the influx of investment, about 40 percent of people continue to live on less than $US1 a day. The country is among the most impoverished in the world, with rampant illiteracy, unemployment, and poor health. The UN Human Development Index ranks PNG 145th out of 177 countries—on a par with Sudan. A number of similar projects launched in the past worsened the plight of many villagers, with mining giants inflicting severe environmental damage. The most infamous example was the Australian mining giant BHP’s dumping of 80,000 tonnes of tailings (rock waste)—containing copper, zinc, cadmium and lead—directly into the Fly and Ok Tedi rivers every day for two decades. According to one expert, it will take more than 300 years to clean up the area affected by mining pollutants. Of the 7,500 full-time jobs expected to be generated in the initial construction phase of the new gas project, just 1,500 will be allocated to PNG workers. When the LNG plant begins operations in 2014 it will directly sustain 850 positions. These limited employment opportunities are typical of the capital-intensive mining industries that dominate the PNG economy. Increasing numbers of young people are abandoning their home villages and a life based on subsistence agriculture. In Port Moresby and other urban centres, however, there are few jobs available, producing increasing poverty, homelessness, and related social problems. The PNG economy remains dependent on revenues from large-scale mineral projects, and as a result, is highly vulnerable to external shocks, particularly from any decline in commodity prices. The current commodities boom brings its own problems. ACIL Tasman’s impact report on the Exxon-led project cautioned about the possibility of “Dutch Disease” hitting PNG. For economists, “Dutch Disease” refers to an influx of revenue from natural resources exports raising the value of the country’s currency, adversely affecting manufacturing and agricultural exports. ACIL Tasman concluded that it was virtually certain that increased revenue flows from the project would see an appreciation of PNG’s currency, the kina. Selling PNG’s other exports, such coffee and copra, would then become more difficult, leading to a loss of jobs in the agricultural sector. 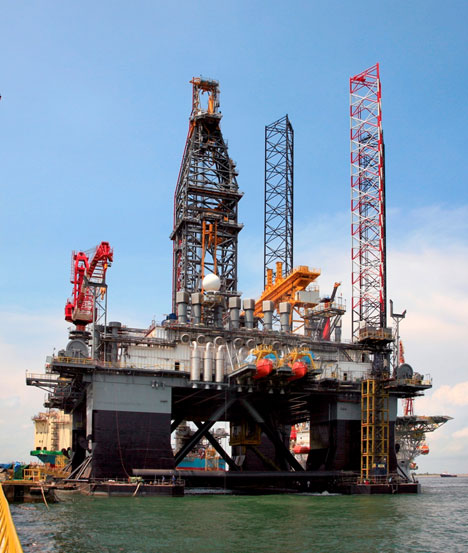 Dallas headquartered ENSCO International Inc, (NYSE: ESV) has finalized a construction contract with Singapore’s Keppel FELS Limited for the seventh ENSCO 8500 Series ultra-deepwater semisubmersible rig. To be named ENSCO 8506, the rig’s total project cost is currently projected to be $560 million. Delivery is expected in the second half of 2012. The contract follows shortly after the award of the sixth semi, ENSCO 8505, announced on June 1, 2008. ENSCO 8506 will be part of the company’s eight-rig deepwater fleet that includes the ENSCO 7500 deepwater semisubmersible that has been in service since 2000. The first four of the ENSCO 8500 Series rigs to be delivered are contracted to customers for term work commencing upon delivery, and marketing of the three latest ENSCO 8500 Series rigs already is underway. The first of the seven 8500 Series semis was contracted at Keppel FELS in 2005 and is on track for shipyard delivery in the third quarter of this year. It has been chartered to Anadarko and Eni for operations in the U.S. Gulf of Mexico. The ENSCO 8500 Series semisubmersibles are based upon an ENSCO proprietary design. Features include a two million pound quad derrick, offline pipe handling capability, automatic station keeping ability to DP2, and 150-man living quarters. The 8500 Series rigs will be capable of drilling in up to 8,500 feet of water. With these capabilities and features, the rigs will be especially well-suited for deepwater development drilling. Keppel FELS Limited (Keppel FELS) has won the contract to build the seventh ENSCO 8500 Series¨ deepwater semisubmersible (semi) worth US$560 million. This sum includes equipment specified by the owner.